Raumfahrt+Astronomie-Blog von CENAP - Blog: Astronomie - Sonnen-Flare Richtung Erde: Silvester Sturm? 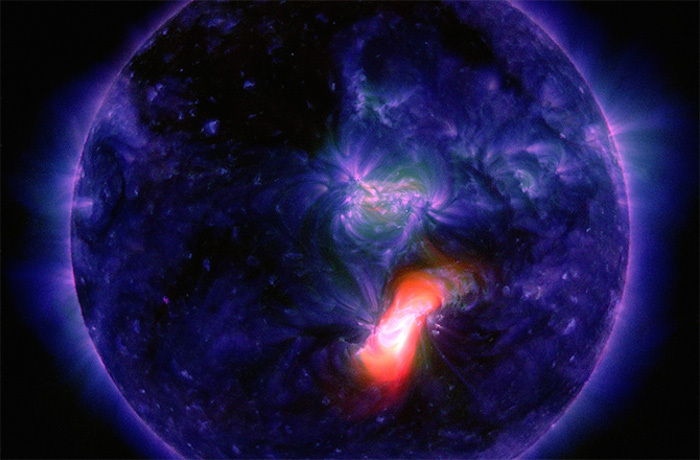 As the magnetic field lines become forced together above these sunspots, magnetic reconnection may occur, accelerating solar plasma to relativistic speeds, generating intense bursts of radiation. These are solar flares and their radiation reaches Earth in minutes. However, CME’s are bubbles of magnetized high-energy plasma that are ejected into space at high speed, but nowhere near relativistic speeds. CMEs can reach Earth in several hours or a few days, depending on the ferocity of the eruption.And today’s flare and CME happened to be generated by the same sunspot that was Earth-directed, maximizing our chances of having a geomagnetic storm right in time for New Year’s. So if you live in high latitudes, and pay attention to the sky, you may be in for a New Year treat as high-energy solar particles impact our atmospheric gases, generating bright aurora.